Just how much potential is embedded in the local strip mall with its acres of surface parking? A project in Montgomery County, Maryland, provides a great example of how to transform car-oriented suburban development into a walkable place with a mix of uses. 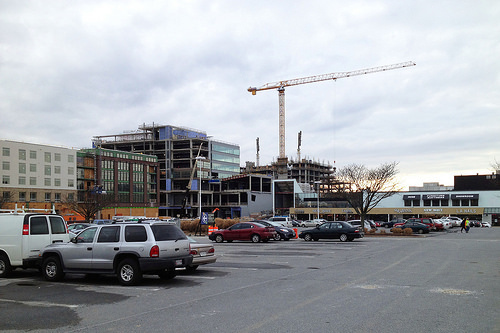 Dan Reed has been tracking the progress of Pike + Rose, a big mixed-use development that is being constructed on the site of a former strip mall in North Bethesda. It will eventually include a new network of streets, and plans call for it to link up with bus rapid transit on Rockville Pike. When it’s finished several years from now, Pike + Rose will contain 9 city blocks with 3.5 million square feet of apartments, offices, shops, and restaurants, as well as a movie theatre and music venue. I’ll be five times the size of Bethesda Row, which developer Federal Realty also built. After about 18 months of construction, Pike + Rose is beginning to look like a place. Cladding is beginning to cover the buildings’ frames, and windows are starting to go in. Grand Park Avenue, envisioned as a bustling street lined with storefronts and dining patios, is still a mud pit, though it now has curbs. Around the corner is Muse Alley, the first of several public spaces in the development. Evan Goldman, Federal Realty’s vice president of development and my tour guide, explained that the lower level would be a deck with movable tables and chairs and surrounded by a “forest” of birch trees. Overlooking it will be a beer garden. There are three buildings in the first phase. Two are apartment buildings: Pallas, an 18-story building that’s still being framed, and PerSei, a mid-rise building that will open this spring. Aaron Kraut at BethesdaNow got to take a look inside PerSei last week. White Flint has been in planning for years, and it’ll take decades for it to fully become a more urban place. The first phase of Pike + Rose offers us a glimpse of White Flint’s future, but also suggests a path forward for other aging shopping centers around the region. Elsewhere on the Network today: Vibrant Bay Area says the Google bus controversy has sparked some good discussion about transportation and healthy cities. The Economics of Place notes that many communities in Michigan now see placemaking as an important strategy for improving the economy. And I Bike TO writes that the city of Toronto seems stuck in constant study mode when it comes to protected bike lanes.